On November 3, 2012, Professor Yutaka Kondo in the Department of Earth and Planetary Science won the Medal with Purple Ribbon, which is awarded to individuals who have made outstanding contributions to academic and artistic developments, improvements, and accomplishments. 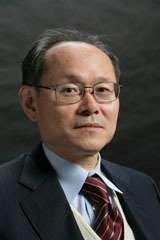 Professor Kondo has long worked to advance research and education in the science of the global atmospheric environment through the development of innovative measurement techniques. Focusing consistently on the principle of pursuing higher measurement accuracy in observation, he has carried out balloon, aircraft, and ground-based observations around the world using newly developed measurement instruments and promoted research projects in Japan and overseas. He has made outstanding contributions to understanding important issues in atmospheric environmental science, such as the mechanism of stratospheric ozone depletion, factors causing tropospheric oxidation/air quality variation, and key processes of aerosol (fine particle) affecting climate change. In the study of stratospheric ozone, he succeeded for the first time in the world in directly measuring nitric oxide and total nitrogen oxides at all stratospheric altitudes, contributing substantially to elucidating the mechanism of ozone depletion at northern middle latitudes and in the Arctic. He also strove to develop new techniques for measuring black carbon, which heats the Earth, and revealed temporal and spatial variations of black carbon in Asia and the Arctic. He was elected as a Fellow of the American Geophysical Union (AGU) in 2009, due to these internationally renowned research activities.